The big smartphone releases of 2013 are getting underway with the Sony Xperia Z already drawing a lot of interested Android fans towards it. The device is launching running the Android 4.1 Jelly Bean operating system, but according to reports it may not be too long before the Sony Xperia Z 4.2.2 Jelly Bean update is released. While today the smartphone world is gearing up for the HTC event taking place later in New York and London, the Sony Xperia Z has already gone up for consumers to order now with the handsets release coming early. While the handset will come with Android 4.1 straight from the box it seems Sony won’t be hanging around updating their new flagship device. 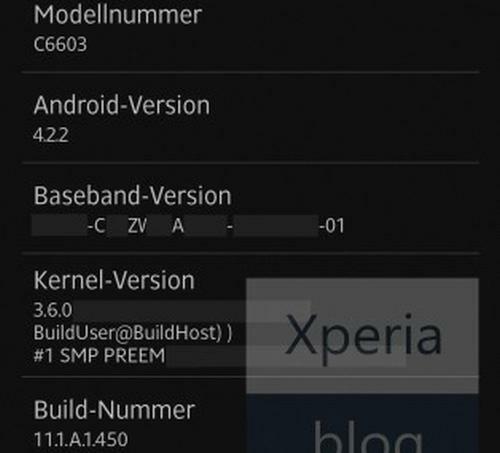 The guys over at Xperia Blog have been provided with a screenshot that can be seen on this page, which is from the Sony Xperia Z (C6603) and is powered by the latest version of the Android Jelly Bean operating system, 4.2.2. This is of course a beta version of the firmware but if it is the real deal a release can’t be too far away from being provided for the handset. The smartphone will feature an updated 3.6 kernel compared to the 3.4 kernel that is found in the stock Android 4.1.2 software. It is believed the Android 4.2.2 Jelly Bean update will be officially released for the handset by the end of March, at least in Europe, and if accurate there will be many happy owners of the new smartphone out there. Are you getting the Sony Xperia Z and pleased to hear the handset could be updated soon after its release?